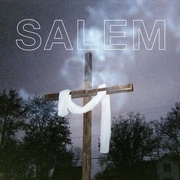 Salem have inspired so many words of late – defining words, descriptive words, weirdly defensive words; dictionaries-worth of what and they are and are not – that you arrive at their debut album, King Night, feeling that there will be nothing to listen to, and the phenomenon of this Midwestern trio is nothing but a smoky mirage. Their music, though. It's blurred, peripheral, melodically vague, vaporous, elusive; beats punch and patter then voices, both sung and drawled, smear them away. But is it so slight? On the evidence of King Night, it is not. John Holland, Heather Marlatt and Jack Donoghue's dissociative songs are perversely immersive enough to quell the critical chatter, for 43 minutes at least. King Night's opening (and title) track is an anthemic blast of all the Salem's key ingredients at once, although the slowed-down, opiated rap that Donoghue contributes to the group flashes up for only briefly as a disembodied voice drawls: "I... love...you" before the glassy synths and layered choral vocals kick in. The practice of combining simple, almost banal melodies with brutal, damaged rhythms and omnipresent distortion is nothing new, but by 'Frost' these opposing elements are ramped up to a genuinely captivating level. Marlatt's voice at times recalls the self-conscious sound of Telepathe, but she gives herself to this song with an appealing vulnerability, winding the notes like question marks around Donoghue's purring, frenetic house beats that, set against the vocal, take on an ornate, psychedelic resonance, slow-fast, micro-macro, tired-wired. But while King Night's first ten minutes conveys hazy and harsh blissfulness just right, it's also unexpectedly safe. This is ethereal electronic indie that draws from club music and 1980s guitar bands with confidence, adept at that grainy sensory overload sound that bands like Animal Collective (whose more crazed moments Salem remind me of more than once on this record) and Gang Gang Dance put on the map, but with little definite character of its own. When the album heads towards more extreme depths, when Donoghue's pitch-shifted growl signals an increase in bass and industrial synth tones alongside the hazy sung vocal, we are in a far more intriguing place, albeit an uncomfortable one. It's uncomfortable because, if tracks like 'Asia' and the lush-sounding remix of 'Redlights' are night at its most dreamlike and sharply sensual, 'Trapdoor' is more like night when you don't do days. Verse and chorus are linked with a sample of a car crash; aside from Donoghue's vocals the dominant sound is a fluctuating filter, something reversed, repeated throughout to nauseating, K-hole lengths. There's no daylight in any of Salem's music – it is thoroughly committed to the nocturnal, as are the band's soporific and disconcerting mixtapes – but night's most alienated aspects come to the fore in a track that brings to mind the urban paranoia of Godflesh or Tricky as much as it does DJ Screw. It's uncomfortable, too, because it plays with your sense of space, time and identity - and Salem are a lot about identity, identity in negative. They shrug off direct questions about it, about the esoteric/occultist references in their music and visual art (though this is hardly an unusual aesthetic in the US underground right now), or refuse to discuss race while directly referencing juke, crunk and hip-hop, or imply that slowing a white guy's voice down so he sounds black is the same as reversing a guitar, or relate grim life experiences in such a prosaic way that for us to react - to care - is to somehow miss the point. That doesn't mean it isn't there, though, and the depersonalised, altered voices that drive Salem so strongly – all of the band members are vocalists, after all – suggest less a disavowal of identity and more a compulsion to blur and smear it, try to erase it and see what emerges in its place. One thing certainly that emerges for me is that King Night's most effective tracks are not necessarily the epic monster ones like 'Killer', which will be amazing and pulverizing when played live and loud in dark rooms, but on headphones sounds dourly gothic. Instead, the more understated and tripped-out 'Tair' features a simple, descending bass line and a scattered sample of handclaps, framing a melancholy rap and ricochet of high, soulful, wordless notes, heavy and fragile at the same time. The song's volume seems to pulse in and out, giving an odd illusion that belief is flickering in and out too; that there is a lit-up connection here amid the dark and disconnect.